Here we show some high energy snack idea that are nut free, vegan, dairy free, and gluten free. Recent studies suggest that emergency room visits due to anaphylactic allergy reactions are rising (JACI 2016). 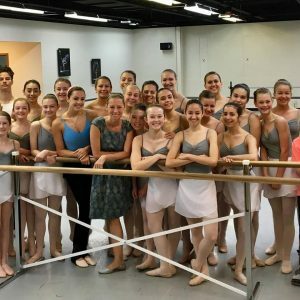 Nut allergies can be some of the most serious and potentially life threatening food allergies which is why many schools and dance studios are opting to go nut free. So where does that leave dancers and athletes who want quick, easy snacks? While nuts are certainly a great source of protein, brain building essential fats, vitamins, and minerals for those who don’t have allergies, it’s possible to tweak recipes to contain seeds instead of the more allergenic nuts. Luckily there are also many nut-free, gluten free, dairy free snack options that can be easily made ahead and packed. chia seed pudding with dates, sunflower seed butter (or pumpkin seed butter), vanilla, cinnamon and water. 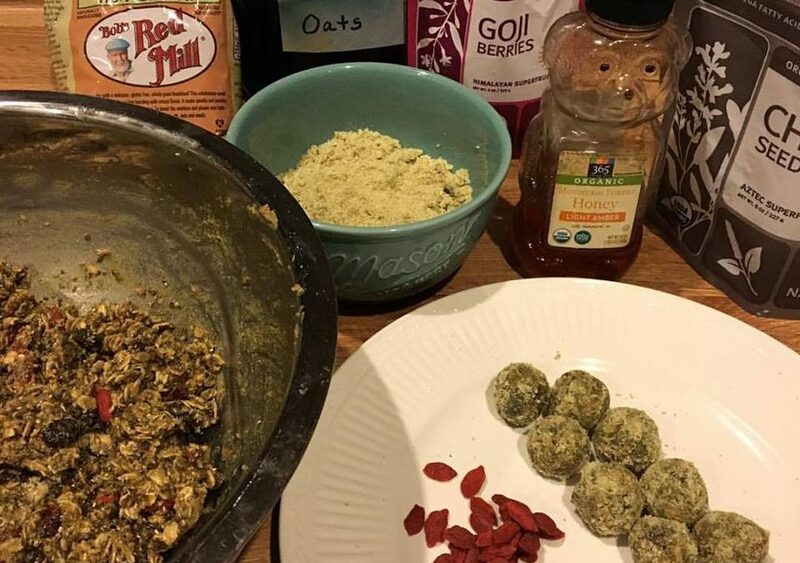 Many energy roll recipes have a nut butter as a binder. Start by making your own pumpkin seed butter (so yummy!) by blending roasted pumpkin seeds, salt, and a sprinkle of maple syrup in a high power blender. Add sunflower seed oil as needed to create the right consistency. Did you know that pumpkin seeds have more protein but less fat than peanuts…well, now you do… onward. Blend up raw pumpkin seeds, and rolled oats in the blender, you can use half this mix as a filler in the energy rolls recipe and half as what you will roll them in at the end to prevent sticking. Now it’s time to get creative by adding ingredients that make you happy and mixing them all up to create a batter that sticks together when you roll it into a little ball. (these rolls are super flexible and customizable). In a large bowl combine whole roasted pumpkin seeds with the pumpkin seed butter you made previously (or just sub sunflower seed butter) then added rolled oats, chia, hemp and flax seeds. Sweeten with added honey, raisins, and Goji berries. Then added ground up buckwheat cereal and half of the mixture of seeds/ oats that you made at the beginning. Bonus points if you add cacao nibs. Extra bonus points if you add grated ginger. 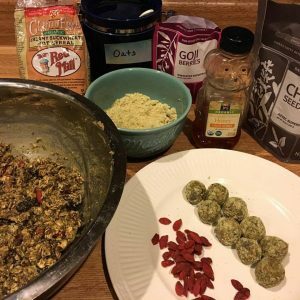 Making energy rolls is so easy and can be customized in any way that works for you. Tip: wet hands with water before rolling to make it easier. Here’s a photo of a recent Nutrition for Great Performances class I taught where I brought the Nut-Free Energy Rolls and they were a hit! The Nutrition Resource Book for Dancers has over 50 recipes and inspirational quotes from leading dancers. Because Real Dancers Eat.